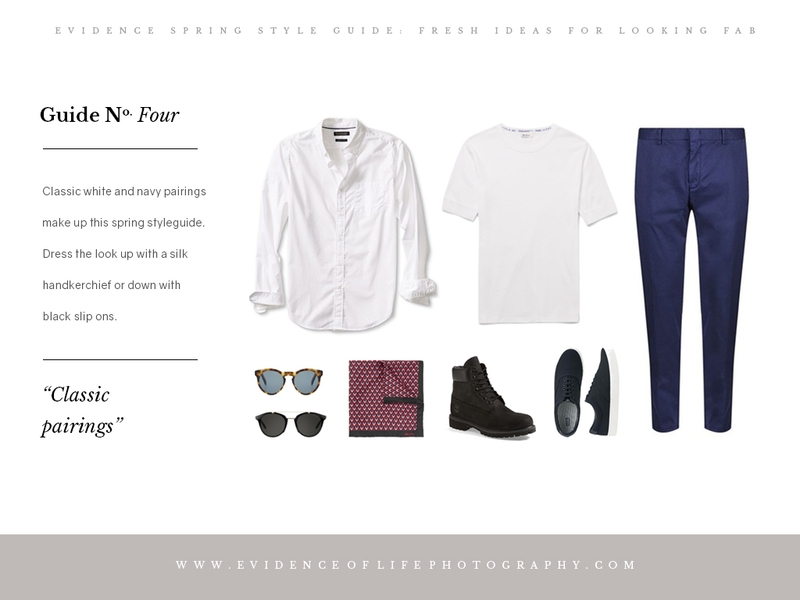 Above all, we believe what you wear to your portrait session should reflect your character and personal style. 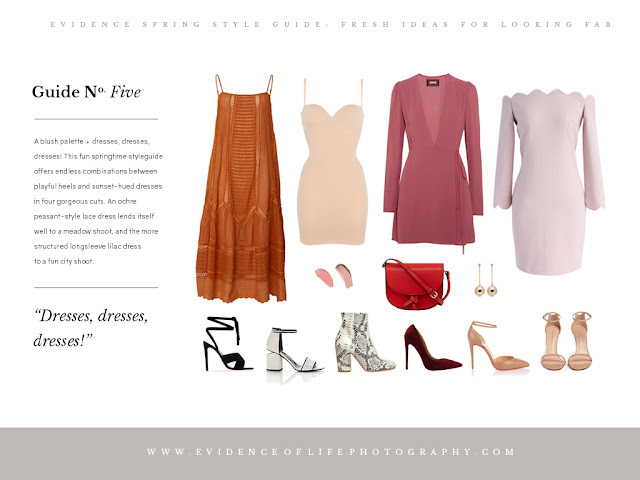 But, if you feel like you're stuck or unsure how to plan your wardrobe for photos this spring, here's a little inspiration based on current trends in color and fashion that are sure to help you look and feel fabulous in front of the camera. 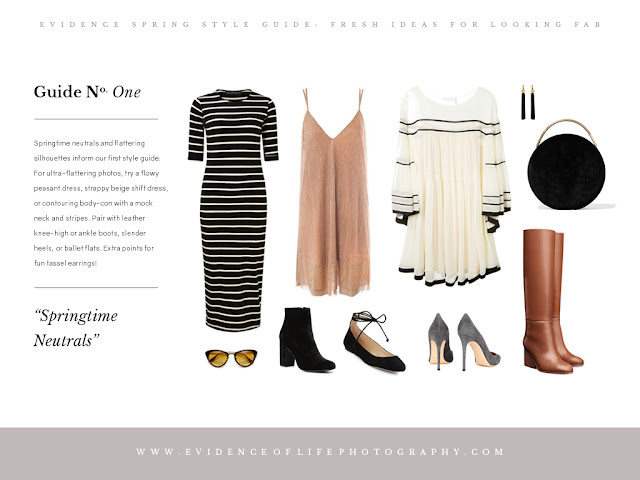 Springtime neutrals and flattering silhouettes inform our first style guide. For ultra-flattering photos, try a flowy peasant dress, strappy beige shift dress, or contouring body-con with a mock neck and stripes. 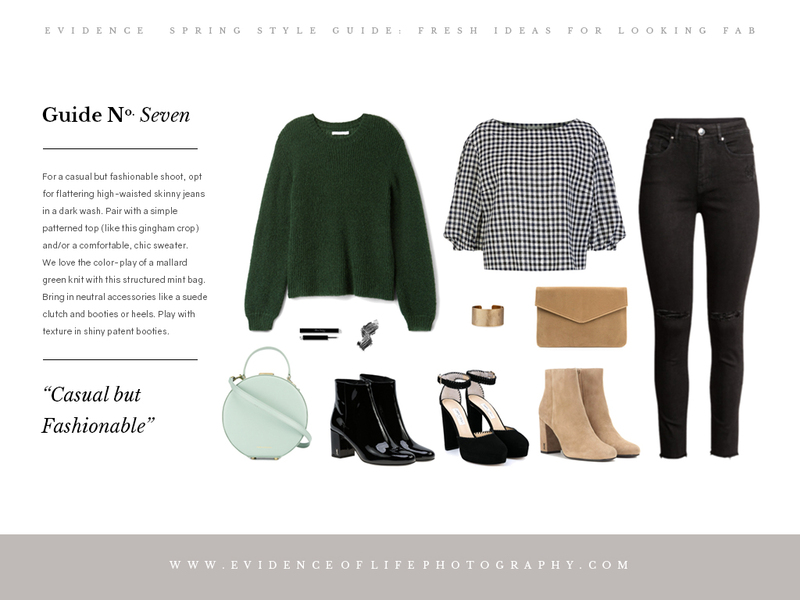 Pair with leather knee-high or ankle boots, slender heels, or ballet flats. Extra points for fun tassel earrings! 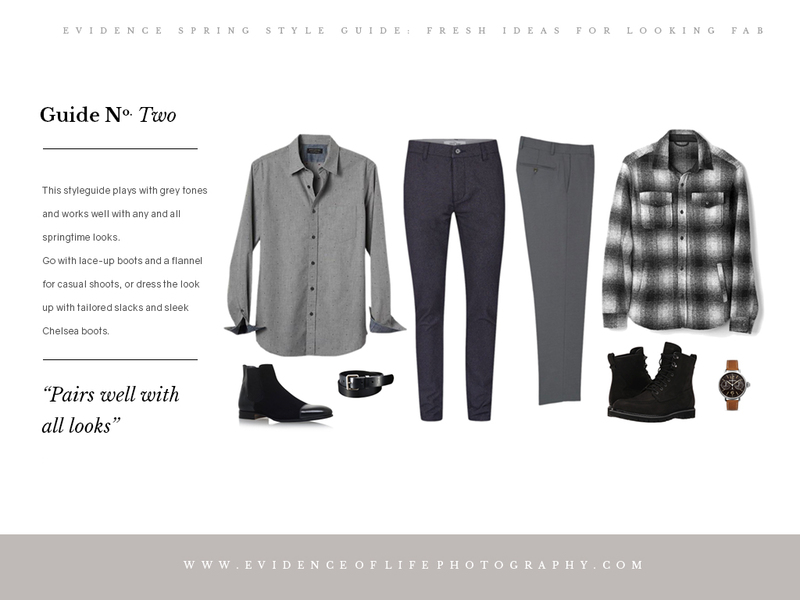 This styleguide plays with grey tones and works well with pretty much any and all springtime looks. Go with lace-up boots and a flannel for casual shoots, or dress the look up with tailored slacks and sleek Chelsea boots. A daring styleguide for the fashion enthusiast! 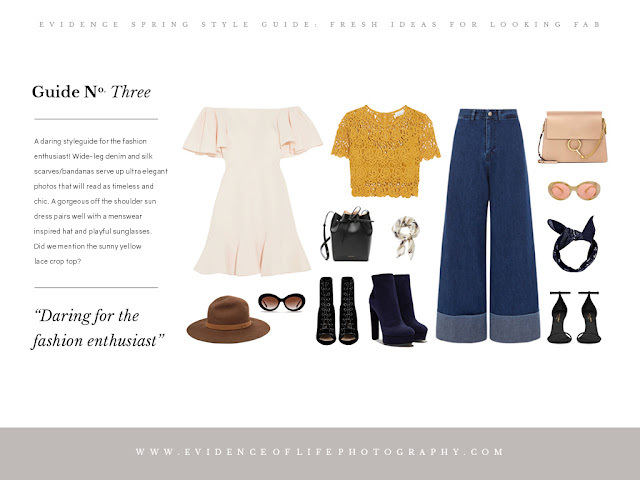 Wide-leg denim and silk scarves/bandanas serve up ultra elegant photos that will read as timeless and chic. A gorgeous off the shoulder sun dress pairs well with a menswear inspired hat and playful sunglasses. Did we mention the sunny yellow lace crop top? Classic white and navy pairings make up this spring style guide. Dress the look up with a silk handkerchief or down with black slip ons. A blush palette + dresses, dresses, dresses! This fun springtime style guide offers endless combinations between playful heels and sunset-hued dresses in four gorgeous cuts. An ochre peasant-style lace dress lends itself well to a meadow shoot, and the more structured longsleeve lilac dress to a fun city shoot. 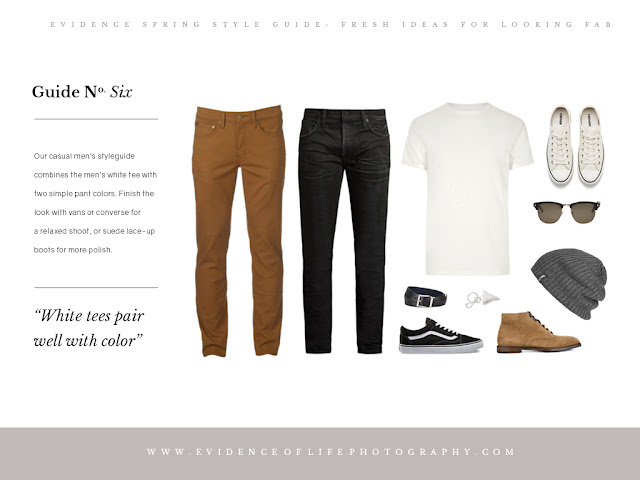 This casual styleguide combines the plain white tee with two simple pant colors. 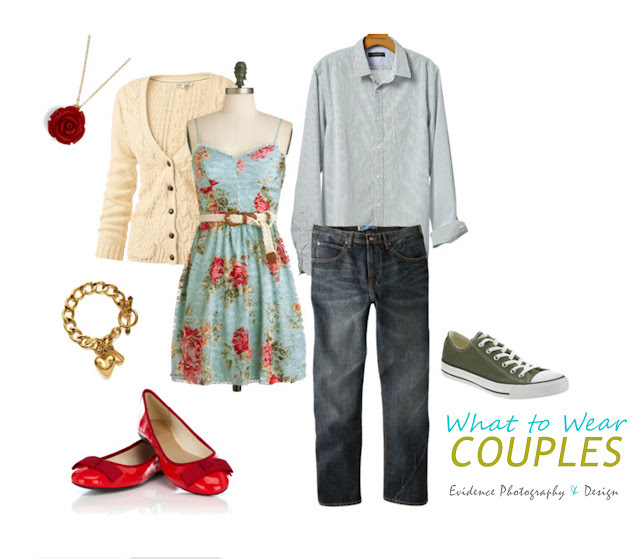 Finish the look with vans or converse for a relaxed shoot, or suede lace-up boots for more polish. For a casual but fashionable shoot, opt for flattering high-waisted skinny jeans in a dark wash. Pair with a simple patterned top (like this gingham crop) and/or a comfortable, chic sweater. We love the color-play of a mallard green knit with this structured mint bag. Bring in neutral accessories like a suede clutch and booties or heels. Play with texture in shiny patent booties. 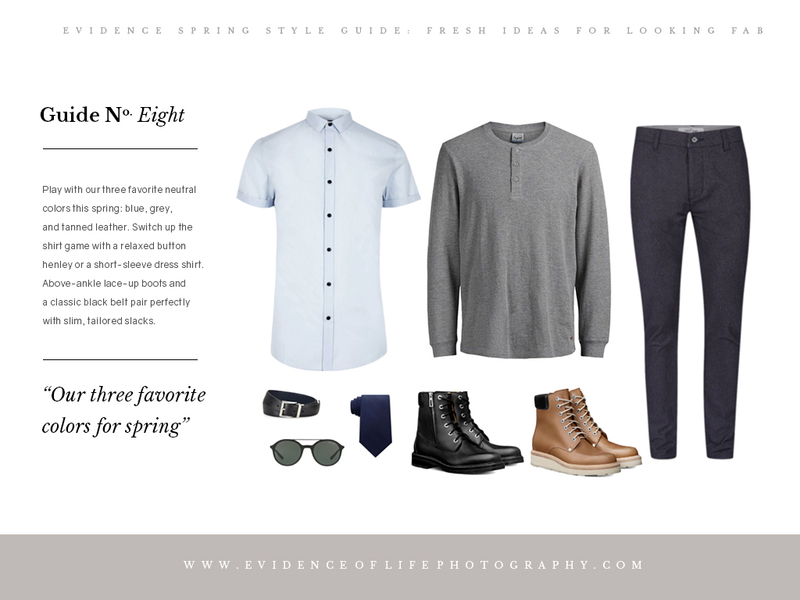 Play with our three favorite colors for spring: blue, grey, and tanned leather. Switch up the shirt game with a relaxed button henley or a short-sleeve dress shirt. Above-ankle lace-up boots and a classic black belt pair perfectly with slim, tailored slacks. 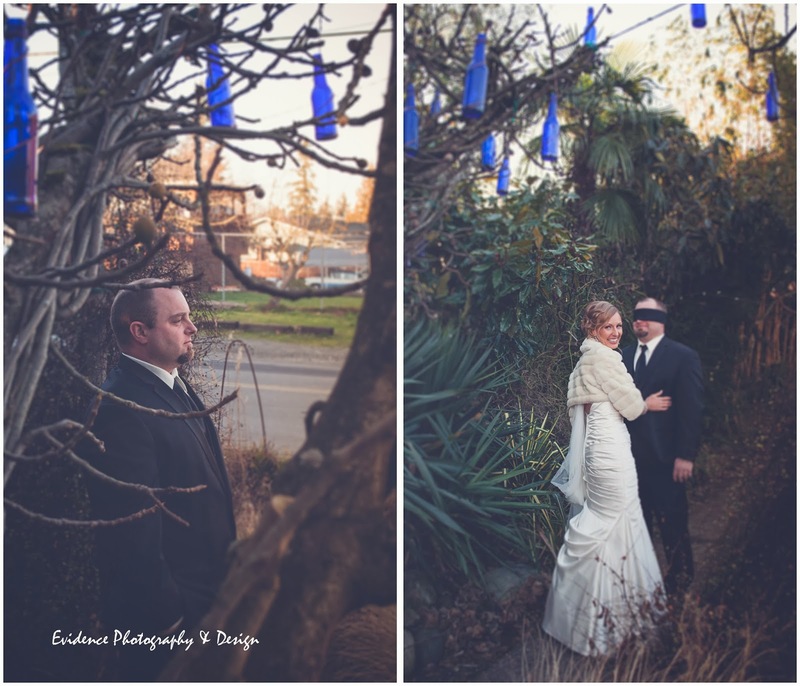 Are you planning a group shoot, but unsure about how to coordinate? Check out this post on how to coordinate colors without looking too matchy-matchy: "What Should We Wear to Our Portrait Session?" Looking for more ideas and inspiration. Check out our What-to-Wear archive.